The worldwide colocation market will bring $36.1 billion in annual revenues by the end of 2017, suggests a report by industry analysts 451 Research. That’s a considerable increase from $22.8 billion in revenues projected for this year – 78 percent of which belongs to small local players. Researchers also note this is the first quarter APAC replaced EMEA as the second largest colocation market. 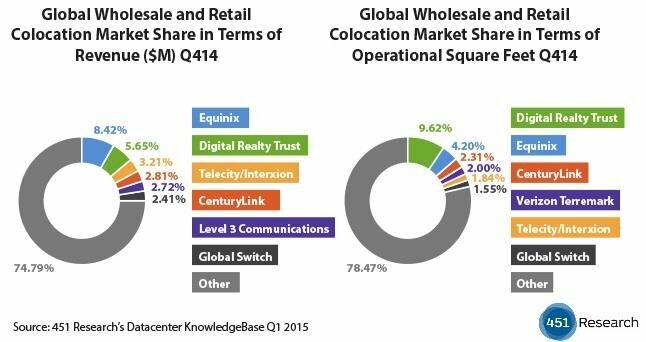 According to the latest quarterly report from 451 Research, Equinix is currently the market leader in colocation, taking in around eight percent of global annualized wholesale and retail colocation revenue. Digital Realty is the second largest supplier in terms of revenue, at almost six percent, despite having more square feet in operation than any of its competitors. In terms of geographic split, today the North American market remains the largest, supporting almost 42.6 percent of global colocation space. It is followed by Asia-Pacific (26.5 percent), Europe and the Middle East (26.4 percent), and Latin America (4.6 percent). 451 Research says this quarter marks the first time it has observed the APAC colocation market growing larger than that in EMEA. 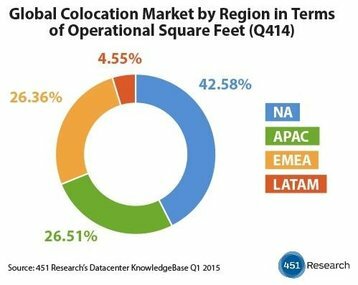 It estimates that the global colocation market will continue growing in terms of total operational space, from today’s 108.9 million square feet to 149.7 million square feet by the end of 2017.